This chicken breast with feta and artichoke is a life-saving weeknight dinner recipe. This particular recipe makes eight servings in less than 20 minutes — perfect if you’re cooking for the whole family or for a week’s worth of protein for yourself. Marinating chicken breasts in tart yogurt, lemon juice, garlic, and spices not only steeps it in brilliant flavors, but it also tenderizes the chicken for a juicy and delicious main course. Though the marinade is technically enough to finish off this dish, we’ve added an extra punch of fiber and nutrients with a savory mix of sun-dried tomatoes and artichokes. Top with feta cheese to tie together all of the Mediterranean flavors. This easily adaptable dish can be paired with any side. If you’re looking to add carbs to the meal, complement the chicken’s zesty flavor profile with the hearty sweetness of Mashed Sweet Potatoes. Or if you’ve had your fill of carbs for the day, try this Kale and Broccoli Matchstick Salad with Hazelnuts for a crisp, earthy, and cool accompaniment to the warm poultry. 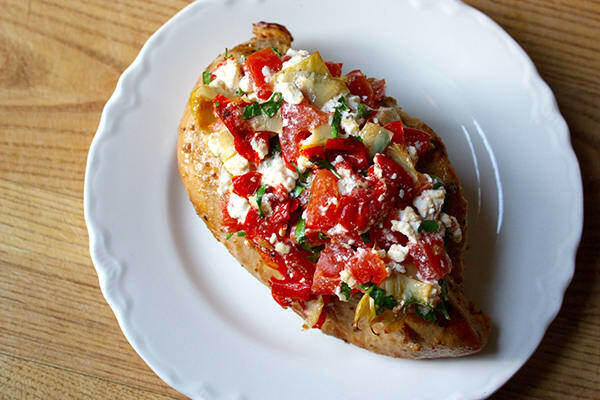 A yummy and healthy Greek-inspired chicken dish! A protein and accessory as part of lunch or dinner.